FIGURE 5*11 p sheets twist in a right-handed manner along their length. shapes. 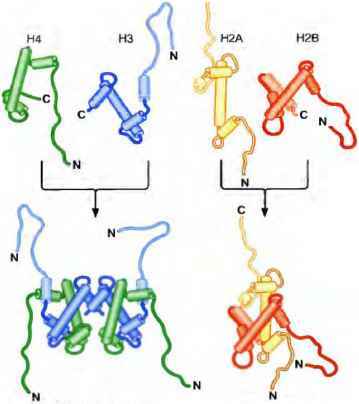 The three-dimensional structures of the polypeptide chains of proteins are thus compromises between the tendency of the backbones to form either « helices or |3 sheets and the tendency of the side groups to twist the backbone into less regular configurations that maximize the strength of the secondary bonds formed by those side groups (Figure 5-12). As we discuss in more detail below, one of the strongest influences on protein folding can be attributed to the burial of hydrophobic (nonpolar) amino acid side groups into the core of the protein's structure. 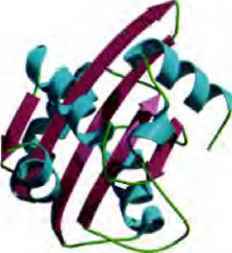 This leads to the prediction that in aqueous solutions, proteins containing very large numbers of nonpolar side groups will tend to internalize the nonpolar residues and be more stable than proteins containing mostly polar groups. If we disrupt a polar molecule held together by a large number of internal hydrogen bonds, the decrease in free energy is often small since the polar groups can then hydrogen-bond to water instead. On the other hand, when we disrupt molecules having many nonpolar groups, there is usually a much greater loss in free energy because the disruption necessarily inserts nnnpolar groups into water.